The elder statesman of a team loaded with young talent, catcher David Ross played a huge role in helping the Chicago Cubs win the 2016 World Series. We are pleased to offer this Ross-signed bat as part of a new series of autographed bats just made available to fans. 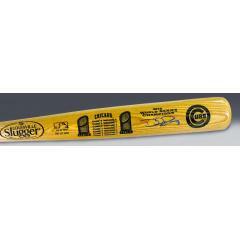 This is an authenticated David Ross autographed Louisville Slugger bat. Ross' signature comes fully authenticated by MLB! This full-sized ash bat features the Cubs logo, includes scores of the World Series games played and is engraved with the 2016 World Series logo. Add this bat to your collection before they are gone. These signed bats are in stock and ready to ship. Due to the limited availability of this offer we must charge your credit card for the full price immediately upon taking your order. This policy ensures we reserve a Ross signed bat for you. We will confirm your order by Email. This bat is not game used.